The aim of Chad's census is to ensure a reliable count of the entire population, including the hundreds of thousands of refugees displaced by conflict in neighbouring Sudan. Photo: Micah Albert. It is difficult to analyze demographic and reproductive health trends for Chad, one of the world’s poorest countries. That’s because so many data points are missing. It’s been almost two decades since Chad’s first -- and last census -- was completed in 1993. Provisional results are now in for the country’s second census, which was enumerated 2009. They present a clearer picture of the country, information that policymakers need for planning health and school systems, roads, water tanks and bore holes. “The Government needs detailed information on the country’s population to better focus its strategic options,” said Mr. Hamida Alladji Ahmat, Director General of the Ministry of Economy and Planning. “The census is an opportunity to get such information,” he added. Like many of the world’s least developed countries (it ranks 163 out of 169 countries on UNDP’s 2010 Human Development Index), Chad’s population is increasing rapidly – more than 3 per cent annually. That amounts to a doubling about every 20 years. This is occurring in spite of the country’s high mortality: half the population dies before the age of 50. With a large youth contingent -- more than half (57 per cent) of Chad’s population is under 18, the population will continue to grow rapidly, even if fertility declines substantially from the current average of 6.3 children per woman. 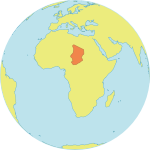 Chad’s population density was measured at 8.7 inhabitants per square kilometer, but this figure hides significant disparities: 43 per cent of Chad’s population 11 per cent of the total country area, in the southern region with a humid climate. Meanwhile, the large strips of land in the Saharan North are barely populated: the Borkou, Ennedi and Tibesti regions have less than 1 inhabitant per square kilometer, mostly nomadic pastoralists, who now only account for around 3.5 per cent of the total population compared 5.6 per cent in 1993. One explanation for their dwindling share of the population is that recurrent drought has compelled herdsmen to settle in areas more conducive to their survival. Significant human, material and logistical resources were mobilized for the Chad’s second population and housing census: over 20,000 staff along with 4X4 vehicles, motorcycles and various other means of transportation were deployed. GPS (global positioning systems) were used to map the entire country. Mobile telephony in areas without network accessibility also played an important role in the success of the operation: several technical and administrative problems were resolved in real time through that technology. However, the process took longer than anticipated, and the cost of the exercise totaled nearly $30 million, which was 50 per cent higher than the initial estimate. Conducting a census is a major undertaking for any country: a population and housing census is among the most complex and massive peacetime exercises a nation undertakes. It is especially challenging for a country like Chad, with its diverse, multilingual population, its vast expanses of roadless areas, its refugee camps housing nearly 300,000 people displaced by conflict in Sudan, the difficulty of recruiting enumerators with the requisite skills, overlapping administrative boundaries, lack of resources and political infighting. Rebel incursions in Ndjamena, the capital city, in April 2007 and in February 2008 also delayed the process and dampened the enthusiasm of partners. The World Bank, for instance, dropped its support. During this time, however, UNFPA, the United Nations Population Fund, continued to advocate for the completion of the census. "UNFPA was more than a technical partner. Its involvement was so keen that it has been designated by the community of census partners to ensure technical follow-up and manage a large part of the financing," said Mr. Ousmane Matar Breme, Minister of Economy and Planning, early in 2009. The Fund assisted in the preparation of technical documents, training of staff, and procurement of vehicles, while helping to mobilize support from other partners. Major external donors were the European Union, Swiss Cooperation, UNDP, UNICEF and the United States. However, the Government of Chad shouldered 60 per cent of the costs, a commitment which was viewed favourably by the other donors. In addition to helping policymakers plan for the future, a census has political implications. In the case of Chad, new information will facilitate country redistricting and allocation of Parliament seats on an objective basis. It will provide answers to some concerns related to the decentralization process initiated in 1999. Without good data, several administrative units did not know their exact population and territorial boundaries. The census data will also provide baseline information for collection of more detailed statistics, through, for example, the Survey on Consumption Patterns and the Informal Sector, Demography and Health Survey, Multiple indicator Cluster Survey, and HIV Prevalence Survey. However, not everyone was initially so enthusiastic. Planners agree that the communication strategy was weak, resulting in a lukewarm reception to the enumerators early in the process. As a result, the Government had to extend the enumeration period (from 20 May to 30 June) and encourage ministers to actively campaign for cooperation. There are still important steps to be completed, including data processing, analysis and dissemination. Analysis of 19 specific issues, including the assessment of non-monetary aspects of poverty, education, demographic and economic characteristics of population, housing demand, and the situation of women and children, will be undertaken. — KOI PIERROT GANDA, Coordinator of the Chadian Network of Population and Development Journalists.